Optical Tweezers – Lightspeed Technologies Inc.
Lightspeed Technologies Inc. works closely with Elliot Scientific to supply Optical Tweezers and tweezer components in the USA and Mexico. We supply complete systems including microscope and stages or system components including laser, single and multiple trap, force measurement, and particle tracking subsystems. Elliot Scientific developed a complete, stand-alone and portable Optical Tweezers for researchers to begin their work on day one instead of spending their time designing, building, and calibrating a system from scratch. This award-winning unit was derived from open architecture designs, and led to a range of add-ons for commercial research microscopes. Today, Elliot Scientific can supply fully integrated systems comprising microscope, lasers, imaging system, optional force measurement, specialist software and the complex opto-mechanical design to make it all work straight out of the box. Single spot particle trapping and manipulation - Compact Attachment to Microscope. The E3300 Optical Tweezers System is designed for single spot trapping and manipulation of micron sized particles. It is designed to be attached to a high quality commercial instrument, converting it into a Photonic Force Microscope (PFM). Computer controlled particle trapping and manipulation. 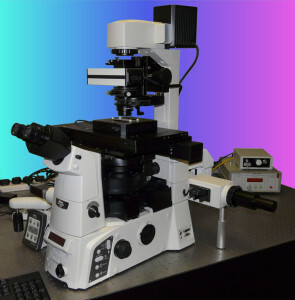 The E3500 Optical Tweezers System is a fully functional computer controlled unit for the multiple spot trapping and manipulation of micron sized particles. It is designed to be attached to high quality commercial instruments, upgrading them to Photonic Force Microscopes. Enhances quantitative measurement capability in research involving optical trapping. Optical trapping is a difficult and multi-faceted technique, involving lasers, microscopes, imaging systems, specialist software and complex opto-mechanical design. The E3100 Optical Tweezers System is a simple, self-contained and pre-aligned, fully interlocked, laser workstation for single beam trapping and manipulation of micron sized particles. It incorporates all the key items of hardware within a self contained portable desktop instrument. Component based Optical Tweezers System - Custom systems for laboratory environments For the advanced researcher a number of different breadboard-based custom systems can be configured using an open architecture format for laboratory environments. This range of systems can cater for the many variations needed by users of optical trapping equipment. QPD Equipped Optical Tweezers System with Force Measurement. Many researchers wish to measure trapping force: so by imaging an interference pattern onto a quadrant photodetector (QPD) and utilising dedicated software, an operator can monitor the position of a trapped particle with nanometer resolution. Demonstrating the capabilities of the E3500 Optical Tweezers system.